A former senior editor at O, The Oprah Magazine, Suzan Colon has written ten books, including the inspirational memoir Cherries in Winter: My Family’s Recipe for Hope in Hard Times (Doubleday, 2009) and Yoga Mind. Suzan has been practicing yoga for nearly twenty-five years and has been teaching since 2002, with certificates in basic and intermediate Hatha Yoga, Therapeutic Yoga, and Yoga for Arthritis. Her writing has been featured in Good Housekeeping, USA TODAY’s Hispanic Living, Woman’s Day for Latinas, and Latina magazine, as well on Huffington Post, Oprah.com, YogaCityNYC.com, and other websites. She has appeared on the Today show, The Early Show, NPR, and other media outlets. Yoga Mind takes us on a deep and delightful 30 day (and lifetime) journey on how yoga can benefit our day-to-day lives. There is practical wisdom on each page, delivered with such wit that I found myself laughing out loud while reading on the subway. The format of the book is ingenious: It is a personal story of dealing with tragedy, mixed with specific day-by-day lesson plans for spiritual growth, and one of the most concise and clear summaries of the yogic path that you will find anywhere. You will savor this book for a long, long time. Most books on yoga explain how to achieve peace through teaching about body postures. Although Yoga Mind includes physical techniques, this book does much more. Through her engaging, accessible style, Suzan Colón explains the principles and attitudes that lead to true inner transformation by sharing practices that anyone can do—no matter what age you are or what shape your body is in. I highly recommend this book. What a refreshing read! It is the yoga that we practice off the mat and in our hearts and minds that can truly transform ourselves and our world. Suzan Colón has written the yoga book that the world most needs right now. Yoga Mind gets to the heart of yoga by exploring practical and accessible ways anyone can bring yoga into their life, even if they can't do a single pose. It's wonderful to have a resource that exposes these powerful tools and shows us how to implement them in order to bring more peace and ease into our everyday life. What a refreshing and empowering book. Suzan's embodiment of yoga through her book gives readers permission to make peace with ourselves and our bodies through this practice. Thank you for this inspiring read. Suzan Colón is a wise, sensitive, and irresistibly sane guide who shares the true meaning and deeper gifts of yoga, and friendship. Reading this beautiful offering of a book and working with the practices described here will change your life. A balm for anyone who is struggling to live better and more truly. Long before yoga became a popular form of exercise, it was considered a state of being. The physical postures that have been popularized in the West emerged much later than the original practices to still and quiet the mind. 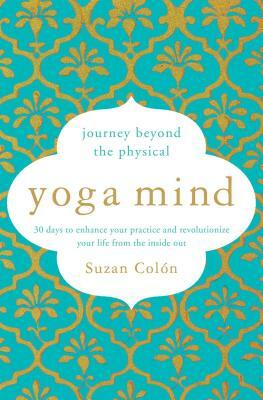 In Yoga Mind, Suzan Colon brings us back to the tools of yoga that are too often forgotten in modern yoga practice, and that are accessible to anyone with a mind, regardless of the body's limitations. She draws the reader in with an utterly relatable story; while we may not have experienced paralysis, most of us have been touched by the types of challenges in life that she shares about so honestly. The book's practical tools provide a way into yoga practice that can be woven into daily life, with or without a yoga mat. It serves as a beautiful reminder to lifelong yoga professionals and practitioners, or a lovely entry point for those just beginning.